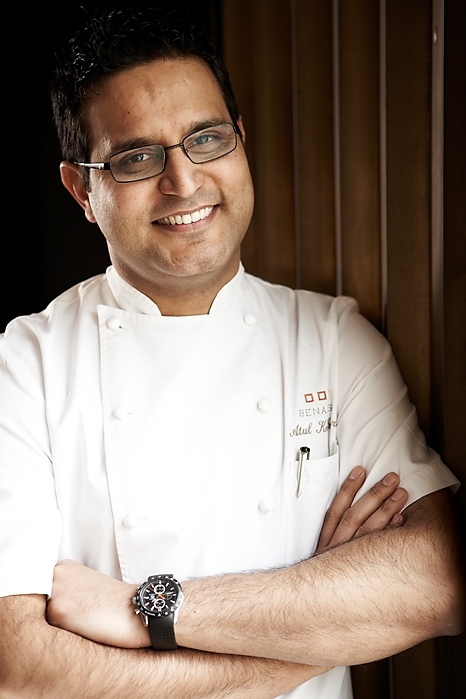 Atul Kochhar is one of the most instantly recognisable Chef’s in the UK, if not globally, and was the first ever Indian Chef to receive a Michelin Star whilst at Tamarind. He later went on to open the world renowned Benares, which now holds two Michelin stars. He also owns Ananda and Sindhu Restaurants. Sindhu is his first ever restaurant aboard a 5*luxury cruise liner. Chef Atul was most kind to answer some questions after I dined at Benares. What drove you into this profession, and what continues to drive you? I grew up around two parents who were passionate about cooking, ingredients and cooking ran through our veins. For me, there was no other career I could ever have loved like I love cooking. It’s the foundations of my Father’s teachings about ingredients and the passion he passed on to me that continues to drive me every day. From where do you draw your inspiration and ideas for your dishes? Would your family be a strong influence and a contributory factor? I travel and eat abroad whenever I can and I bring these influences into my dishes. Indian food is so varied and vibrant I never seem to run out of ideas. My team and I at Benares are constantly pushing each other and challenging each other to produce the most exciting dishes we can. Is there a particular dish that stands out for you, that is your signature dish, and why? My John Dory dish which was my take on Fish and Chips for Great British Menu is probably my most famous, and we still get requests for that now. I think my soft shell crab starter is also probably the most famous in the restaurant- it is always one of my most popular dishes. We keep it fresh and update it regularly, and I think people like the variation. You have three restaurants at the moment, how much time do you spend in them, and how do you ensure both quality & consistency is maintained? I make sure that when I take on a new venture my team and I plan a long way ahead to make sure that things run smoothly when I’m away. I employ each kitchen member myself and so trust the team implicitly when I am not there. I am very confident that even when I’m not at the pass, the food is exactly how I intended. Is it very difficult to find experienced & qualified Indian chefs in the UK or do you have to recruit from abroad? I have a wide network of friends in the business all over the world and so I can always reply on recommendations from them. I am approached for work all the time, and I go on gut instinct, get them into the kitchen for a trial, and see how it works out. I have had some incredible Indian chefs work for me- the talent is most definitely there. With the government tightening up immigration laws, do you think the industry will suffer as a result? Yes – the industry will suffer due to this tightening of laws. But time will tell – whether we survive or perish. Has Sindhu on The Azura been a hit with the passengers, and are there prospects to grow that concept on other vessels? It really has – the feedback is always so complimentary. It seems to really be a highlight of the ship. We’re always open to exciting new offers but there’s nothing definitive in the pipeline at the moment. How does your food compare with the likes of Mela, Mint Leaf and Café Spice Namaste, and is there a friendly & healthy rivalry between you Cyrus Todiwala and Kuldeep Singh? Do you ever get together and ‘swap recipes’? We’ve all been around for a very long time but there’s a huge difference in our styles and restaurants. There’s a healthy rivalry, but I’m of the opinion that we have all worked very hard to raise the quality and perception of Indian food in the UK, and there’s an element of team work and camaraderie there. We don’t share recipes though, that would be a step too far! In 2010, your received the TMG Cordon Bleu Award. What was this award in recognition of? It was in recognition of the fact that I had helped to bring Asian cuisine into the mainstream. It’s an award I’m very proud of as it epitomises what I have always striven to do which is to show how wonderful Indian food is to people who have only ever experienced it in curry houses. I take my charity work very seriously and help out when I can. I think it’s important for Chefs to give back to support the industry and to use any influence we may have for good use. I work with Great Ormond Street Hospital Charity, Find Your Feet, a fantastic charity, and Action Against Hunger very often, but there are many more I support to a lesser extent too. You came to London in 1994. Since then, has the image of Indian food changed a lot? Do you see it as your mission to educate people, both Asian & non Asian about the diversity & variety of Indian Cuisine? Absolutely, and I have seen a huge improvement in just the years I’ve been in the UK. There’s still a long way to go, but people now often know the nuances of Indian food and can speak confidently about what kind of Indian food they’re describing, including the cultural references and geographical differences which distinguish it. That was simply not the case when I came to the UK and it’s very rewarding. Overall, what is the general reception from ‘traditionalist’ Indians about Michelin star Indian food? There’s always controversy about the guide, and Indian food is no different. At Benares we don’t claim our food is ‘authentic’ Indian food, we take the essence of Indian food and spicing and serve it in a modern, western way. It’s what makes it so exciting to serve the food in a way people have never seen before. What foodstuffs would you put in Room 101? I’m proud of my commitment to sustainable food and the environment, so I suppose I’d put in items from restaurants and brands where the environment has been completely neglected. What is your favourite recipe that you can share with our readers? Recipe of John Dory with Oven roasted tomatoes! When will ‘Curries of the World’ (Atul’s third book) be on the bookshelves? We are looking at this autumn for a launch. Watch this space! If you had not become a chef, what would the alternative career have been? I was meant to be a doctor – my family had it all planned out for me. Luckily they were still supportive when I broke the news to them that I was going to catering school though. I wouldn’t have been a very happy doctor. Finally, if you had one wish – what would it be and why? My father was such an incredible man and a true inspiration and it’s truly sad that he is not still around today. I would love to cook for him and share a meal in our hometown. That would be my one wish.